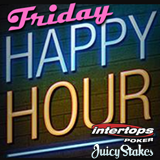 Intertops Poker and Juicy Stakes are continuing their new tradition of adding a little more happiness to Friday Happy Hour this week. Both of the popular poker rooms, which also have a nice selection of slots and table games, are boosting all Blackjack wins by 5% this Friday between 7:00 and 10:00 pm Eastern. Intertops Poker and Juicy Stakes will add 5% extra to all blackjack wins Friday, August 23, 7-10 pm Eastern. To get your 5% Blackjack boost all you have to do is play Blackjack this Friday, August 25th during Happy Hour. Under the Casino tab in each poker room there are several versions of Blackjack to choose from including Double Draw and Perfect Pairs. (Games in Intertops’ main casino do not qualify for this promotion.) Winnings, to a maximum of $250, will immediately be credited to your bonus balances and released for withdrawal once you've completed the 15X play-through requirement. There’s an optional re-draw on hand 15, 16 and 17 in Double Draw Blackjack and in Perfect Pairs Blackjack a natural pair pays 5:1, same-colored pairs pay 10:1 and a perfect pair (both cards the same suit) pays 30X. Details are available under the Casino Promotions tab at Intertops Poker and Juicy Stakes. Known around the world for their busy poker rooms on the Horizon Poker Network, Intertops Poker and Juicy Stakes also offer a selection of online slots and table games from World Match, Lucktap and Betsoft.